The building up of a Park of Laughter was an integral part of the comprehensive development of the Museum HOUSE OF HUMOUR AND SATIRE laid down in the institution's Regulations as early as 1980. The first statue – that of HITAR PETAR created by Prof. Georgi Chapkanov - was mounted in 1981 upon the opening of the 5th International Biennial of Cartoons and Satirical Sculpture. 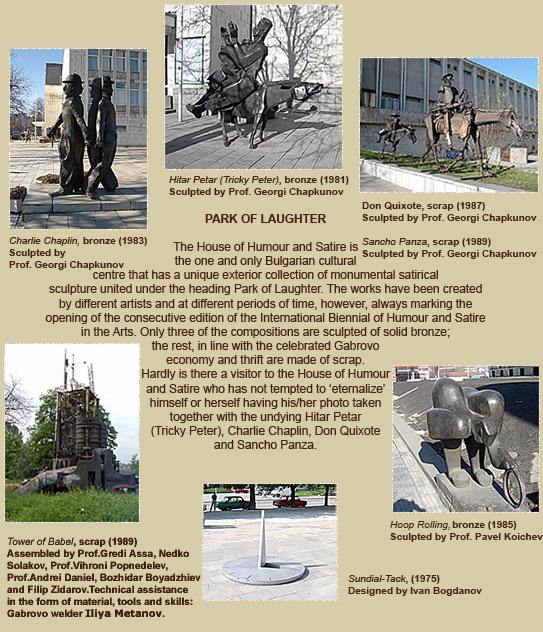 The Park of Laughter was made possible thanks to the artistic contribution of the eminent Bulgarian artists: Prof. GEORGI CHAPKANOV, IVAN BOGDANOV, Prof. PAVEL KOICHEV, Prof. GREDI ASSA, NEDKO SOLAKOV, Prof. VIHRONI POPNEDELEV, Prof. ANDREI DANIEL, BOZHIDAR BOYADZHIEV and FILIP ZIDAROV.